Chris Boardman had revealed during the Sydney olympics he had been suffering from the bone-wasting disease osteopenia for the past two years, which had debilitating effects on his cycling. So, probably not in the shape he had in 1996 when he broke the hour record, he took a final attempt to finish his career. The bike was more or less “similar” to the bike Eddy Merckx used 1972, though his 16 cm stem was obviously longer than normal. Boardman used a 54×14 gear. One can use the split times to plot the average speed at a given distance. Eddy Merckx had started incredibly fast, since he wanted to break Ole Ritter’s 5km, 10 km and 20 km records (Remark: Ritter had set his records on a special ride separate from his Hour attempt!). 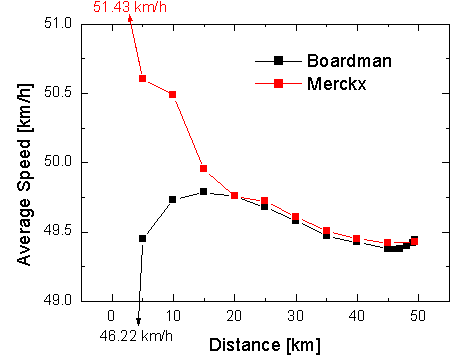 Compare his first km in 1.10 (which gives 51.43 km/h) to Bordman’s 1.17.9 (which gives 46.22 km/h)! Merckx couldn’t hold this pace, Boardman finally “catched” him at 20 km. But from this point Boardman could not gain any more, at 25 km he was again more than 1 sec behind. The following 20 km the distance stayed almost the same, around 20 – 40 meters. Around 47 km he was still behind and began his final effort, increasing his speed over 50 km/h. At 49.25 km he was 2 meters up on Merckx, the final round of 51.8 km/h pushed him to 49.441 km. Note that Boardman’s attempt was made at sea level, while the Mexico City track is at 2250 m. This should give an advantage of about 2 km/h. Look at “Hour Record at altitude” page for details. 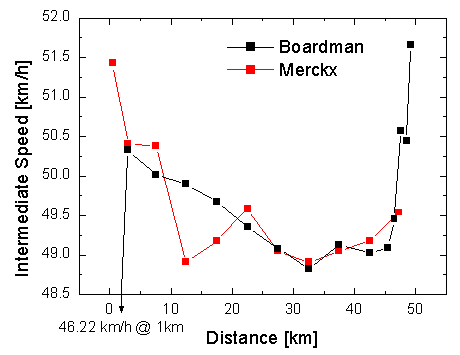 The biggest difference in both attempts is the first kilometer, the next 45 km are almost parallel, though Merckx showed a remarkable decrease in speed between 10 and 20 km. Its quite obvious that Merckx, who was about 800 m ahead of Ole Ritter’s old record, just put in some “normal” effort at the end of his attempt. Boardman however knew he was behind Merckx, so he gave everything at the end of the attempt to get in front.